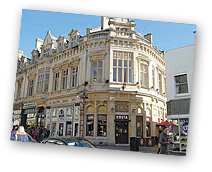 Discover luxurious accommodation situated in the very heart of Cheltenham at 24 The Promenade. This stunning five-star, self catering apartment is perfect for those looking for a comfortable and relaxing stay away from home, with all the lavish furnishings to make your short break truly special. With private parking outside this stunning grade || listed building in the promenade, our luxury accommodation in Cheltenham provides all you need for the perfect weekend-break or mid-week escape. For those looking to stay a little longer, we also offer 24 The Promenade for the whole week, so you can enjoy a restful and special holiday in Cheltenham at one of the finest apartments in town. Whether you’re visiting Cheltenham to enjoy the races or want to discover the outstanding natural beauty of the Cotswolds, our stunning accommodation will ensure your stay is one to remember. The above rates apply all year. No increases are made for Cheltenham Races, Christmas etc. The rate paid is the rate that applies at the time of booking. Payment is via WorldPay. Most credit/debit cards accepted in a choice of currencies - Pounds Sterling, Japanese Yen, Australian Dollars, US Dollars, Euros and Chinese Renminbi. PayPal is also accepted but only in Sterling. A £200 deposit is requested at the time of booking, with the remainder paid six weeks prior to arrival. Please note, Cheltenham Race week is presently booked until 2019. Booking is via via this website. Please click the "Check Availability" button below.